If you have a LinkedIn profile, you can now write an article and have it published on LinkedIn Pulse. Which means there are over 350million potential authors all straining at the bit to get published. But why? Why write a long form post in LI pulse? As a writer just dipping my toe into the LI Pulse waters I can name a few reasons. There is the professional business reason, as you build followers, find prospects and lead people to your website. Then there is the enjoyment of writing a well-crafted piece, and finally there is the ego stroking reason, you have an audience, you get recognition and you can continually strive to beat you last results! But getting views, likes and comments in this crowded market place is not easy, there are a few steps you can take to get your article noticed. Use TAGS to position you piece for your audience of your choosing. 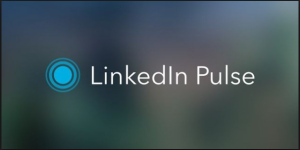 Get to know LinkedIn Pulse, under the tab Interests, you can choose Pulse and then surf around there, check out the influencers, discover the channels, make sure you know where to pitch your article. You have the option to add three tags to any post you write, so you can steer the LI algorithm in the direction you want it to take, and even get your article selected as a featured post. Make sure the title of the article speaks to your audience; answers a question they have; a need they want met. You may be writing an article on tax regulations, but why is that interesting to your audience? Because they want to reduce their tax bill. So a title such as “Learn to Slash your tax bill” will get more interest than a title such as “an overview of the recent tax changes”. Get creative and put your personality into your title. Choose your Topic with care. Now we come to the meat of it – the topic of the article. Make sure your topic relates to the title, is relevant to your audience has includes a smattering a keywords which will help it get found by search functions. But most of all make sure you are writing about something you love, that interests you, and shows you are an expert. LinkedIn is a platform where you can showcase your professional skills so use it to its best advantage. And finally, once you have published your post, make sure you let your network know about it. Post to your favorite LinkedIn groups, add a link to the article in emails, on other social media platforms such as twitter, google+ and Facebook. Don’t leave everything up to LinkedIn Pulse.